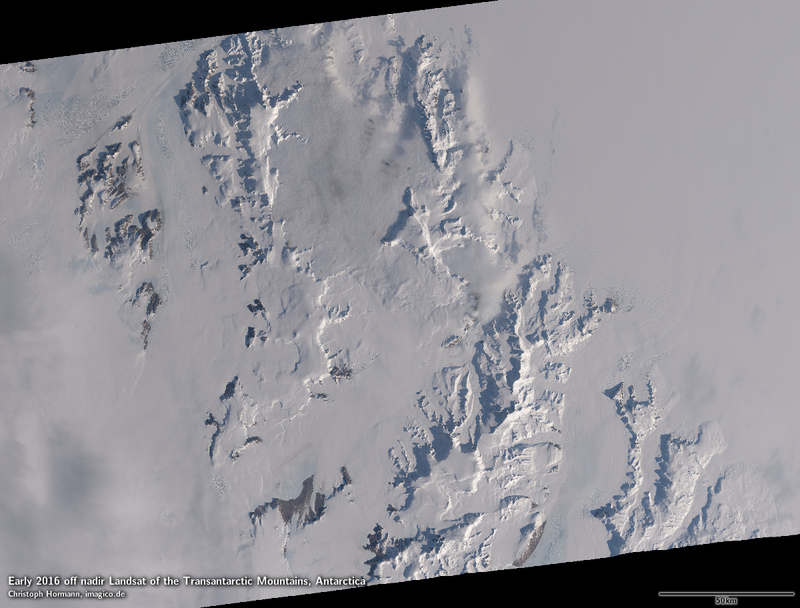 During the last days the USGS recorded some sequences of off-nadir Landsat images in the Antarctic. I wrote about the off-nadir capability of Landsat 8 previously, regularly Landsat can only record images up to about 82.66 degrees latitude. 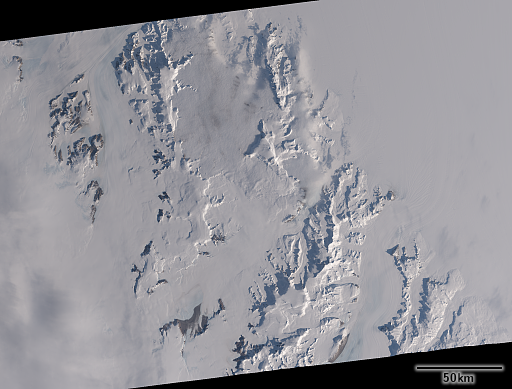 By tilting the view slightly Landsat 8 can record also images somewhat beyond this. 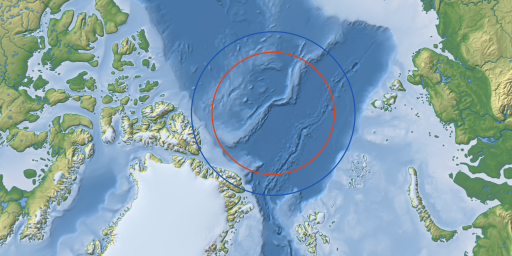 In principle the not recordable area around the pole is thereby reduced from a radius of about 800km to about 600km. 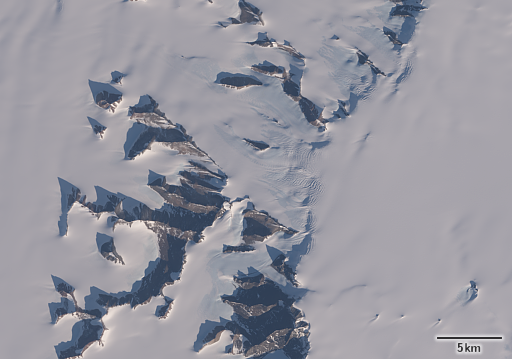 Until now this had only been used once to record a sequence in the north in May 2013 – otherwise off nadir images were only occasionally recorded at lower latitudes. 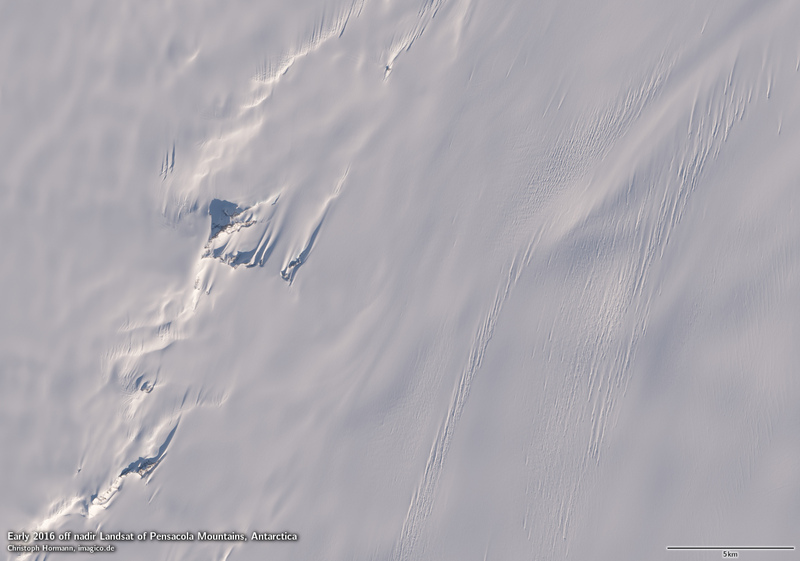 The USGS recently showed plans to integrate such recordings into their normal schedule and they now started doing so in the Antarctic. 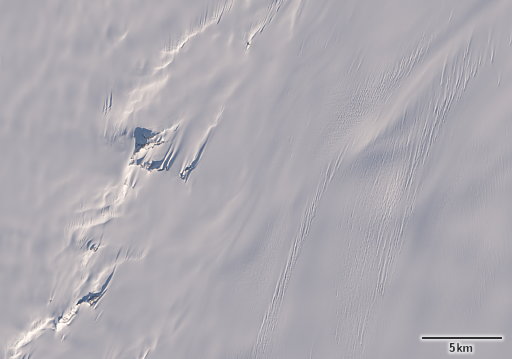 Quite a number of sequences were made to systematically cover the edges of the otherwise uncovered area south of 82.66 degrees. 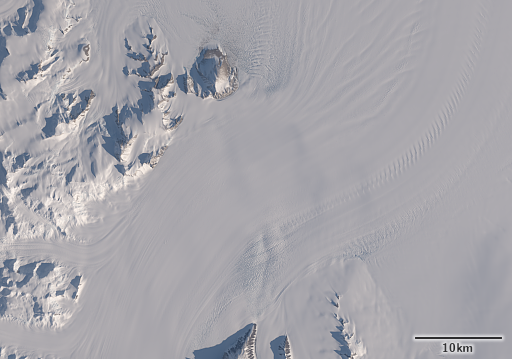 I will only show those parts here with significant features visible, most of the region is nearly featureless ice. The two areas i cover are shown in the following map. All images are approximately north oriented. The first image is from the Pensacola Mountains south of the Davis Valley which i featured in an image previously. On the left side you see the Foundation Ice Stream. The following crops show details from this image. 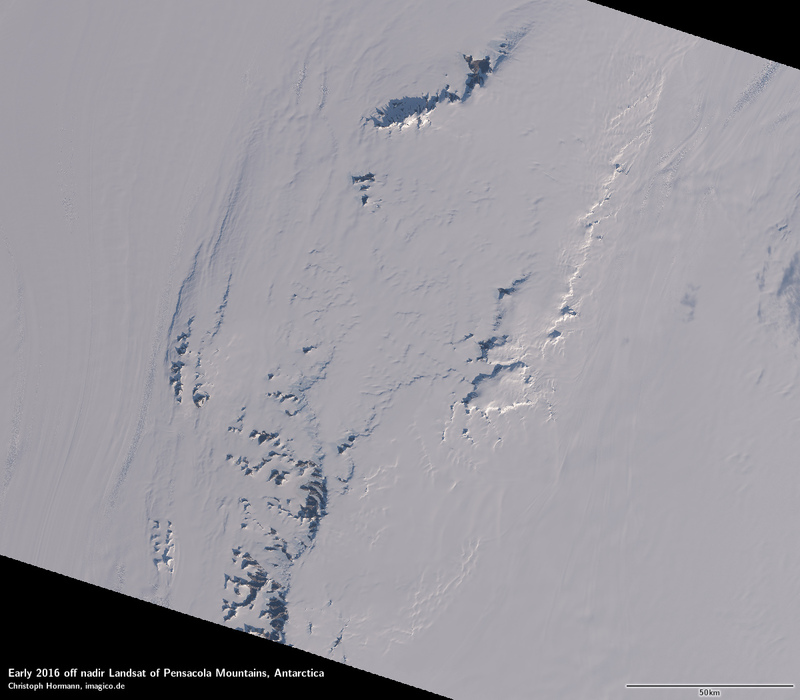 The second view is from the Transantarctic Mountains right south of what is shown here. This image shows the Queen Elizabeth Range and the Queen Alexandra Range as well as the northern part of the Beardmore Glacier, famous for having been the way for Ernest Shackleton and a few years later Robert Scott to access the polar plateau more than hundred years ago. 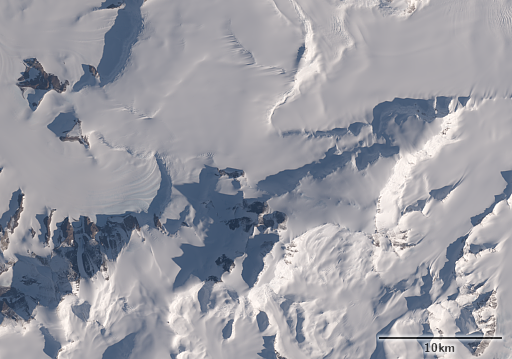 The lower end of the Beardmore Glacier can be seen in the following crop. At the southern edge the image also contains Mount Kirkpatrick, the highest peak of the Transantarctic Mountains. Both of these images are based on scenes recorded directly south of the regular Landsat limit. 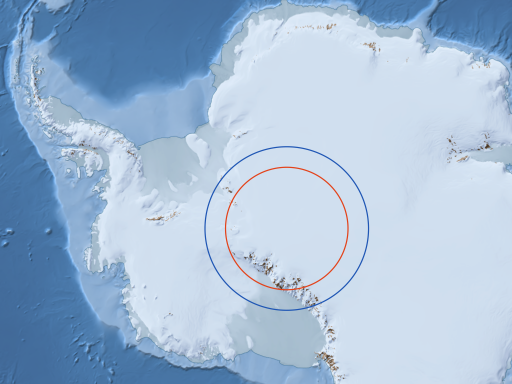 They extend the coverage to about 84.5 degrees latitude which is quite close to 85.11 degrees which is the edge of usual web maps in Mercator projection a.k.a. the end of the world according to Google. The southmost parts of the Transantarctic Mountains extend quite a bit further south of course as visible in the map above.